3DPhotoWorks will be one of the exhibitors at the NFB of Utah convention. They render two-dimensional art into 3D images that can be experienced by the blind. Another example of 3D art. He works for the state of Utah’s Division of Services for the Blind and Visually Impaired. But before that, he had a different job. Now, as president of NFB of Utah, he is reaching out to people all over the state. The organization will hold its annual convention on April 11 through the 13 in the Salt Lake City Sheraton. 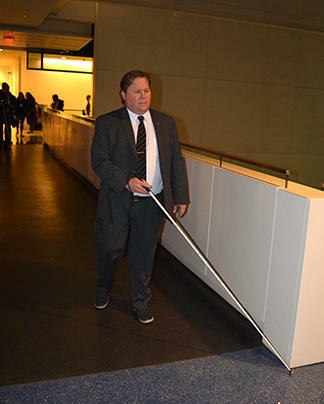 “Our main goal is to help blind people understand, and the sighted community understand, that blindness does not have to hold anyone back from the life they want to live,” he said. “We also raise expectations of individuals who are blind or have low vision, or people that serve the blind or low vision, we want to try to raise expectations because we know that low expectations create barriers and obstacles between people and achieving their dreams. Utah has many residents who are dealing with vision loss, but they don’t all seek services to help them with the transition. The convention will cater to people wherever they are on their journey. “Our general sessions are going to focus on all kinds of different levels. We’re going to talk about how a person that’s new to low vision or new to blindness, what types of resources are available to them, here on a local level and on a national level,” Bacon said. Attendees can also look at high- and low-tech solutions. "We offer an exhibit hall that we call it, and we have different technology vendors that offer all kinds of assistive technology products, anywhere from basic magnifiers and aides and appliances, all the way to electronic video magnifiers, braille displays, talking computers, iPhones that are completely accessible, you name it, we try to find ways to make it accessible. Attendees may also find a new role model or two. “We have, in Utah, we have individuals who are lawyers, who are professors at both Salt Lake Community College, Utah State University, we have blind people who are rehabilitation counselors, computer programmers, video game creators." For more information about the NFB convention, visit their webpage. For more information about services for the blind in Utah, visit their website. Music credit: “Will Play Wonderwall for Food” by Dr. Turtle.